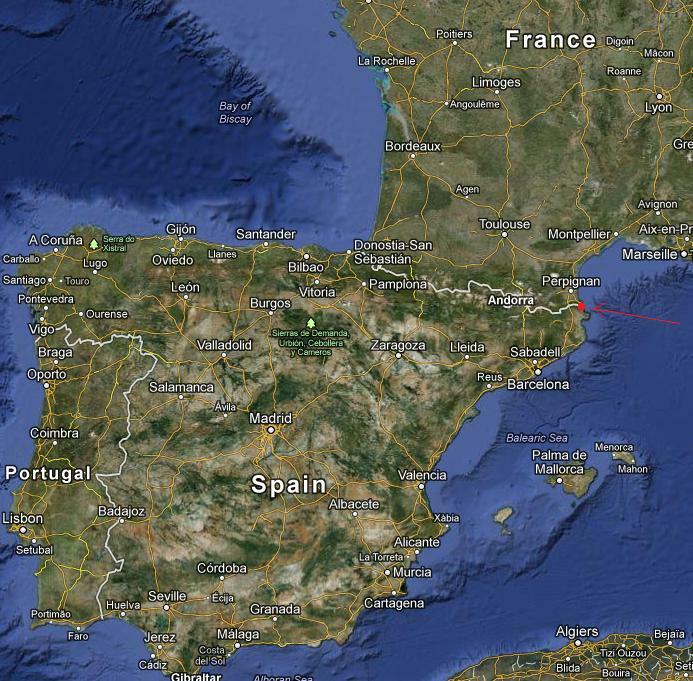 This is the account of our holiday in France and Spain. 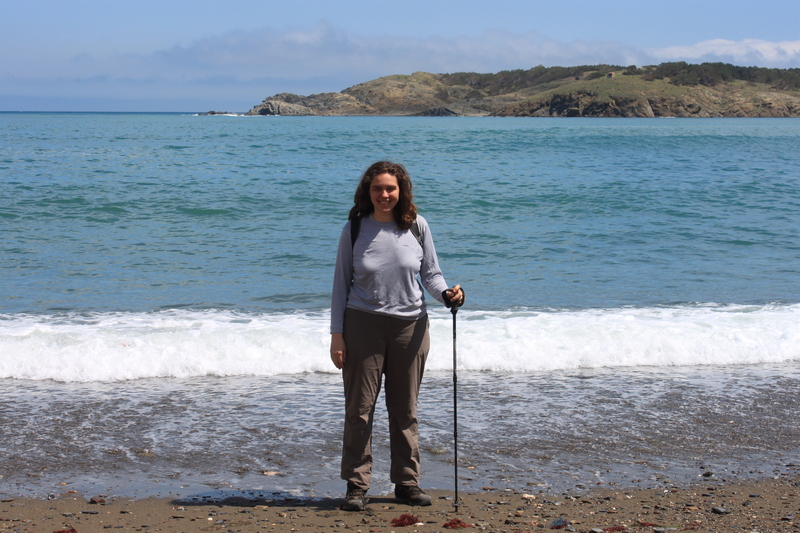 It covers the “long days of hiking” portion of the trip, as we walked from Collioure, France to Port de la Selva, Spain. (Note: all photos can be clicked to expand. For the landscapes especially, it’s worth it for the extra detail!) 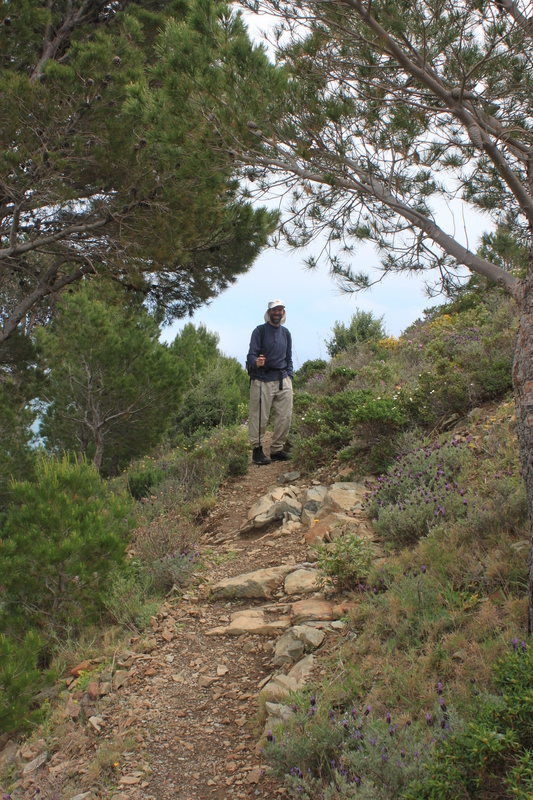 This first portion of our vacation is called “The Walk” because we had a planned five days of hiking ahead, during which we would make our way southward from Collioure to the Spanish town of Port de la Selva along the Vermilion Coast. An outfit called Sherpa Expeditions had arranged hotels for us in each port o’ call, as well as for the bulk of our luggage to be carried ahead of us each day. Most importantly, they provided maps and directions for our cross-country journeys. 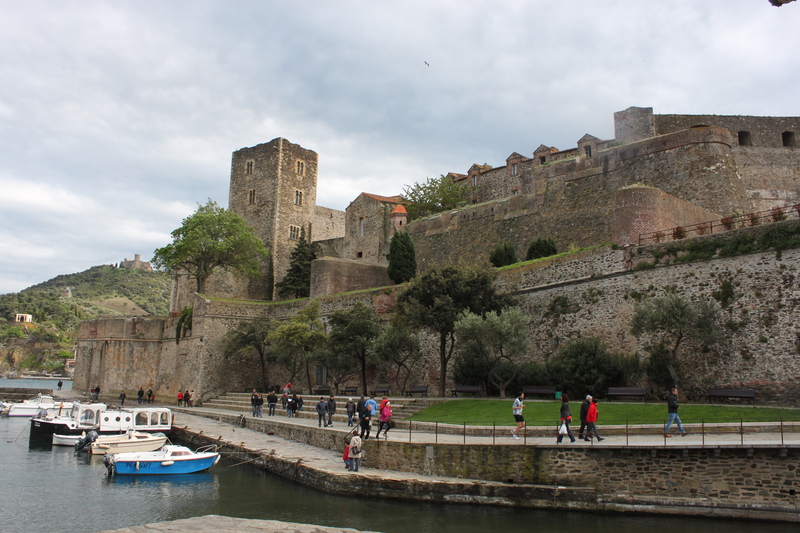 In Collioure, our hotel was “Les Templiers,” a tiny vertical place with an elevator barely large enough to accommodate Kate and I and our two large rucksacks. 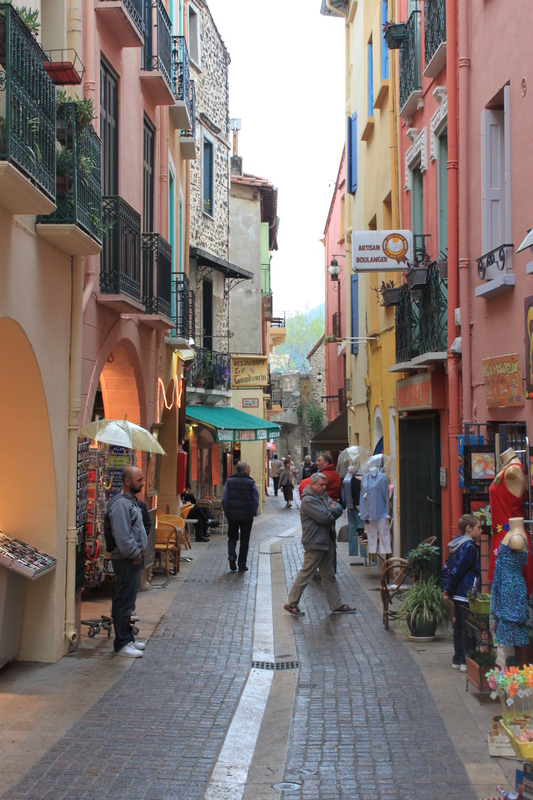 (Speaking of which: to get to the hotel, you had to go through the bar and out the back to a smaller street. I got myself wedged in the exit door, trying to pass through with my pack on, silly American that I am.) Our room itself was about 10′ x 10′, but plenty nice for our minimal needs. 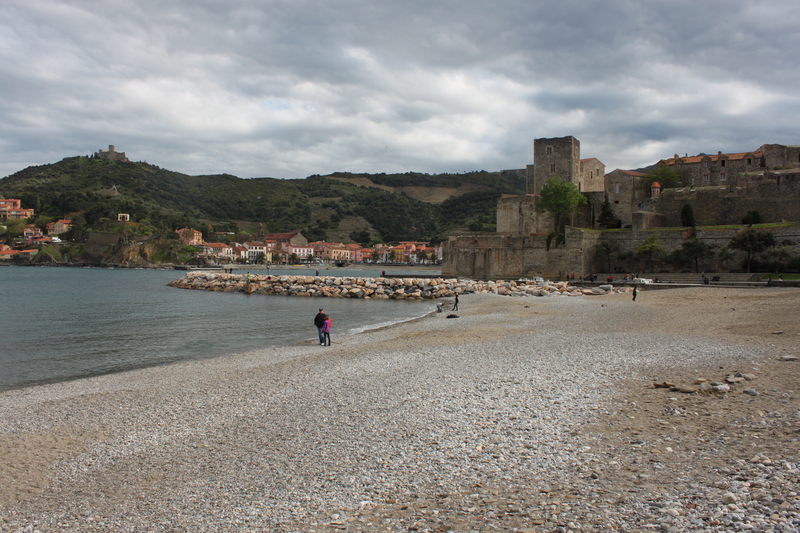 After dropping off our stuff, we wandered about Collioure for a bit, fighting off jet-lag until dinner at a local restaurant. Back at the hotel we FaceTime’d with the kids, and found that my mom and stepfather had managed to fend off anarchy for at least the first 18 hours of our absence. 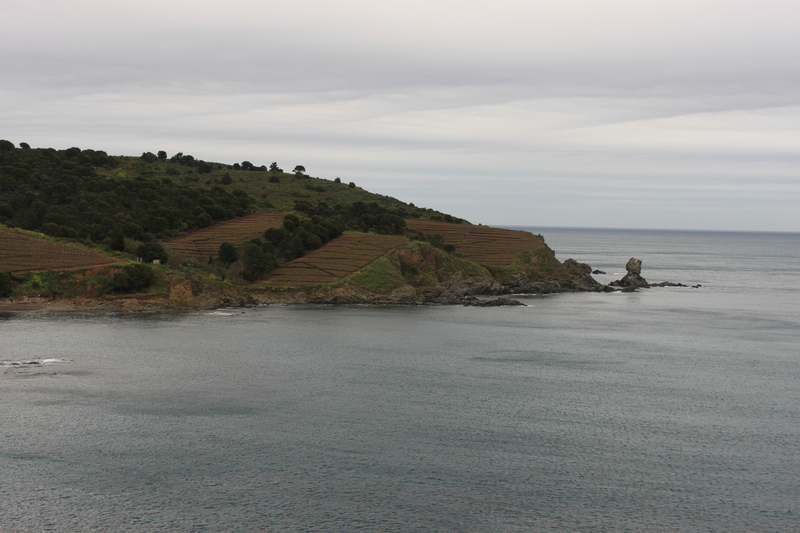 This was supposed to be the first day of a five day, forty mile hike, from Collioure to Port de la Selva. Forgive me; I paraphrase. Things started off with breakfast in the hotel restaurant, while chatting with a travel writer at the next table who commented on the unusually gloomy weather. 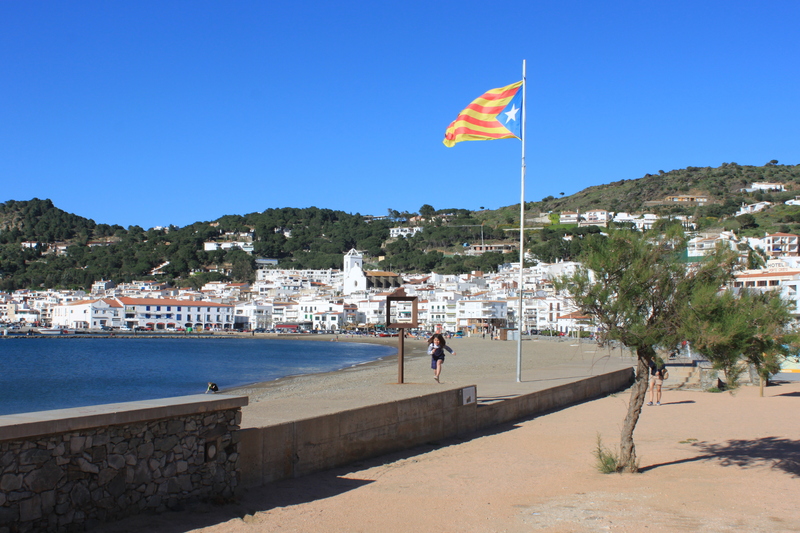 After procuring provisions for the day (anchovy subs and a baguette from a local baker, Pim’s and water bottles from a local grocer), a taxi drove us out of town for half an hour, to the tiny hamlet of La Vall. 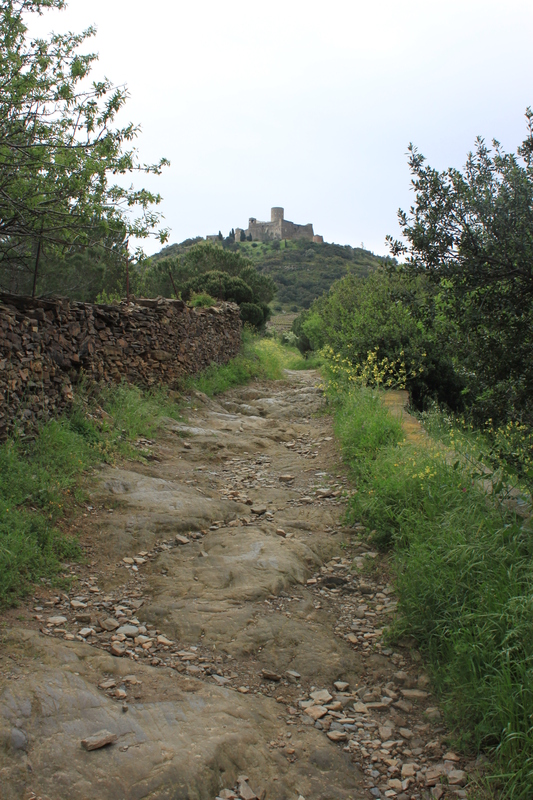 The way this was supposed to work was, we’d get dropped off far from Collioure, and then hike back to town via trails over the mountains. It even started out that way; the taxi left us outside a shuttered church in a town so small, all 20 of its man-made structures fit in an area smaller than an oval quarter-mile track. 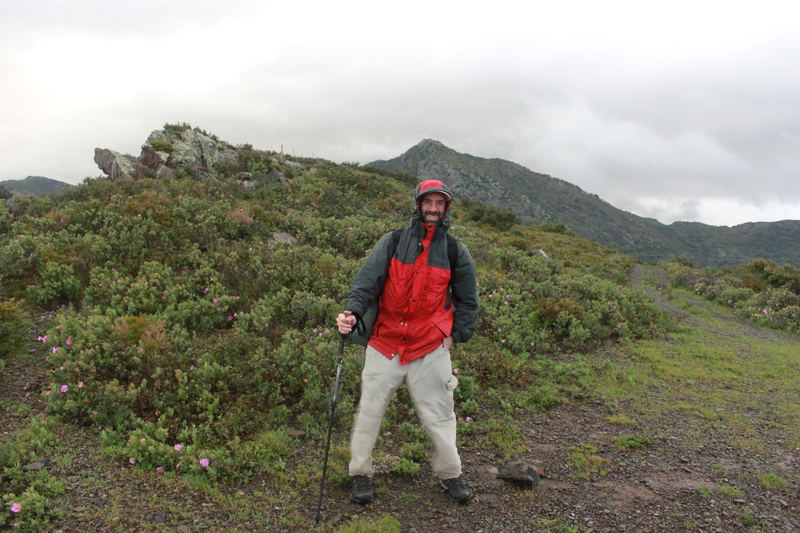 A cold drizzle was falling as the taxi drove away; we pulled out our waterproofed map and direction-sheet and started hiking. The first hour or so was fine, if a bit cold and damp. Our spirits were high, and we took a few pictures. This probably would have been a lovely hike under better circumstances. As we left the last signs of civilization behind and headed up the mountain, the trail split. We consulted our printed materials, and it seemed that either one of the two trail options would work, so we struck out up the tree-covered slope, following a series of orange blazes that matched one of the highlighted routes on our topographical map. In hindsight, the fact that the written directions didn’t specifically mention orange blazes should have been a clear sign of impending disaster, but… er… well, anyway, as we climbed higher and higher, the weather grew worse. After another hour or so, the rain was falling harder, the temperature had dropped and a chilling wind had kicked up, slicing through the trees and setting us shivering in our raincoats. (The actual temperature that day was just about 50 degrees, with wind-chills in the low 40’s.) Then the blazes ran out. The orange slashes on trees and rocks had at some point been joined by orange treble-clef symbols, which was cute, but probably meant we were following marks set by some music camp the previous year, and not anything meant for us. And somewhere up on the mountainside, both slashes and trebles ceased to appear; the trail ended at an orange raincoat wrapped around a tree-branch. 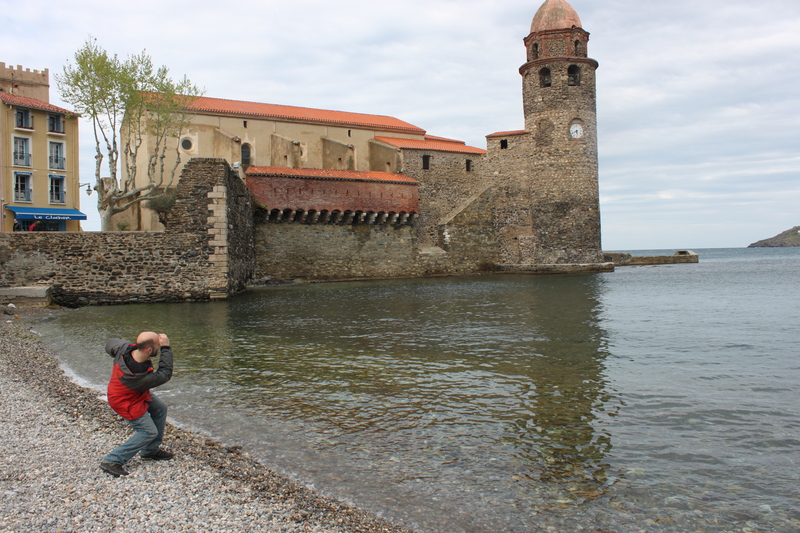 By one o’clock or so we were back at Les Templiers in Collioure, drying off and warming up and happy to be alive. I wolfed down my anchovy sub like I hadn’t eaten in days, and then we headed to a laundromat to dry our clothes and packs. As our soggy stuff tumbled, we reviewed the next day’s map, and holding the directions up to some extra scrutiny in order to prevent a recurrence of today’s failure. Traveler pro tip: before you throw your stuff into a dryer, make sure your wife has really emptied out all her pockets. Especially if they contain an old tube of lipstick. Unless you’re going for the “hiker fresh from the slaughterhouse” look, of course. Anyway, the whole lost-on-a-mountainside fiasco turned out to be a lucky break in hindsight. 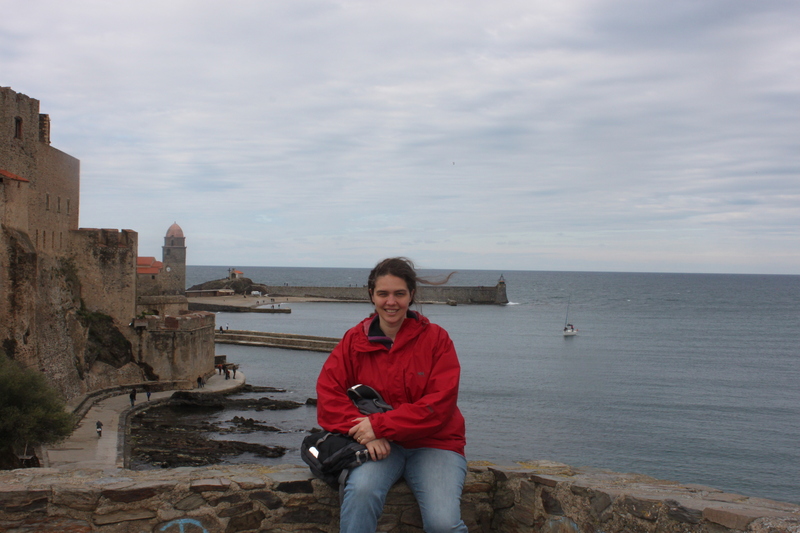 The rain stopped by mid-day, it grew a bit warmer, and we spent a delightful afternoon exploring Collioure. 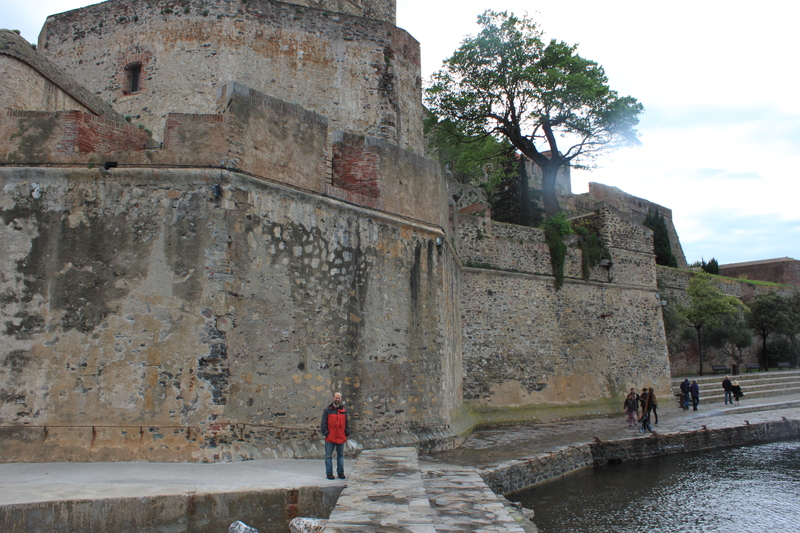 We wandered around the exterior of its castle, explored its little streets, and I even did a bit of juggling with a local who was plying his circus trade on the beach. We also took many pictures, to make up for the ones we didn’t take while freezing in the wilderness. 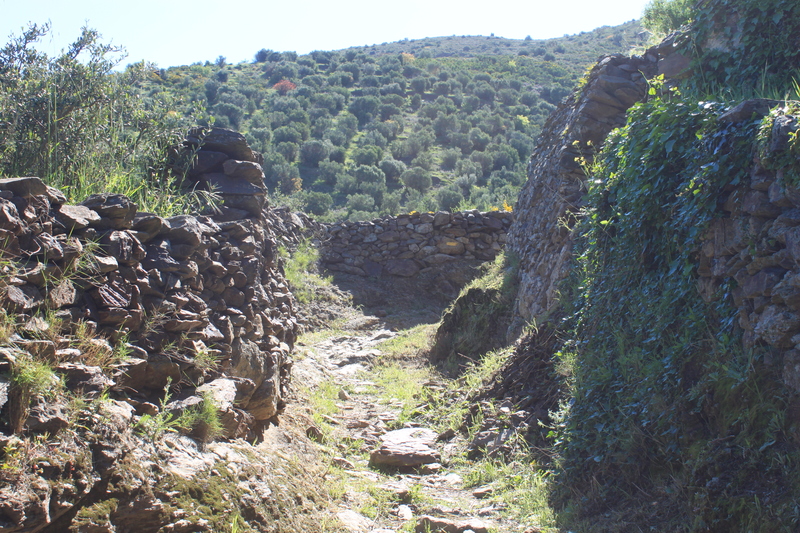 This path around the castle connects the two halves of Collioure. Sure beats seven hours freezing on a hill somewhere. 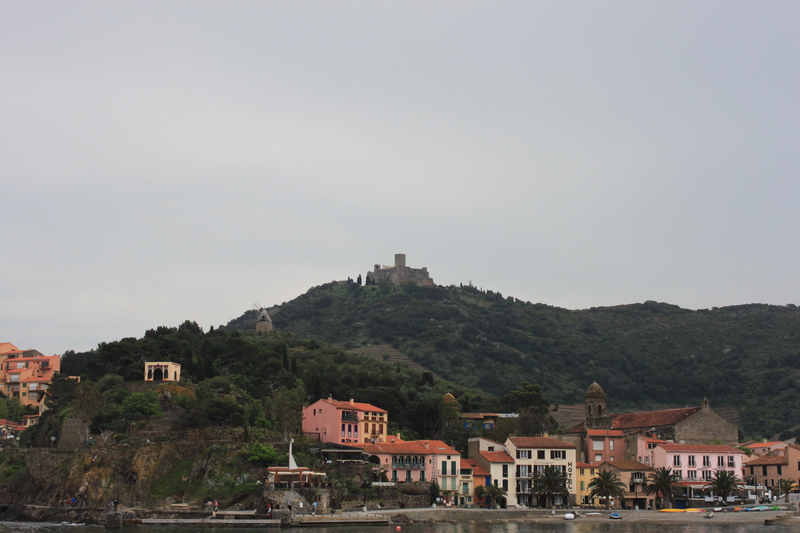 View of the Château Royal de Collioure from the beach. Now no one can say I’ve never skipped a rock into the Mediterranean. If you look carefully at the distant ridge, you can see the tiny nub of a tower about 4/5 of the way along from left to right. That tower was the half-way point of the following day’s hike. 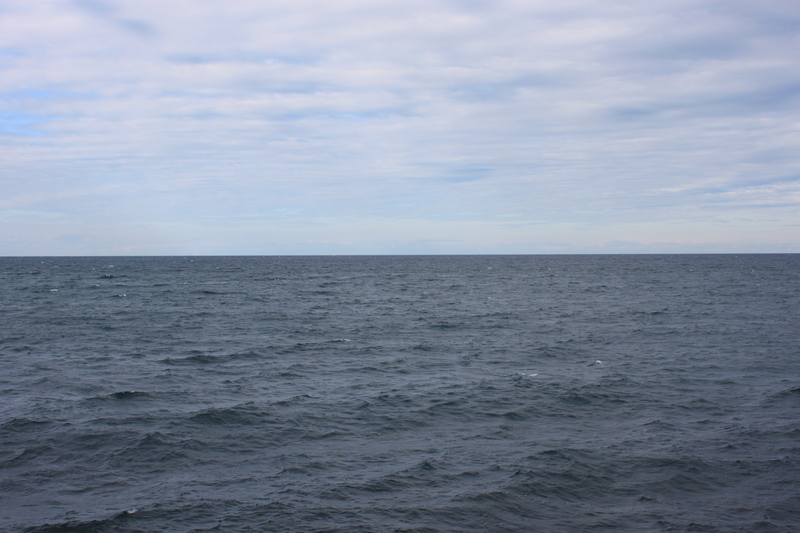 Mediterranean Sea, or North Atlantic? Hard to say at this point. A consultation with TripAdvisor on the iPad led us to l’Ambroisie for dinner, a tiny but wonderful restaurant whose cuisine was not equaled for the remainder of our vacation. We sat next to our travel writer friend at breakfast again; she turned out to be the award-winning Solange Hando, still going strong at 69 years old. She told us a story about visiting the unheralded gravesite of Eugene Poubelle, a French pioneer in trash disposal and drainage, and the reason that trash bins in France are called “poubelles” to this day. 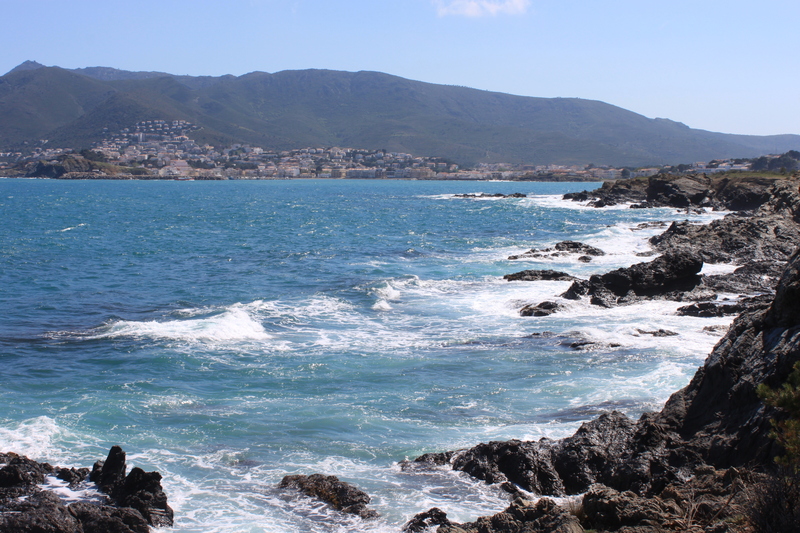 Once more we provisioned ourselves with delicious anchovy subs (Collioure is famous for its anchovies, which have been described as the best in the world), and prepared for a day of hiking. It was another cool day (temps in low 50’s, wind-chills in the low-mid 40’s), but the rain was light and sporadic, and the directions seemed straightforward. 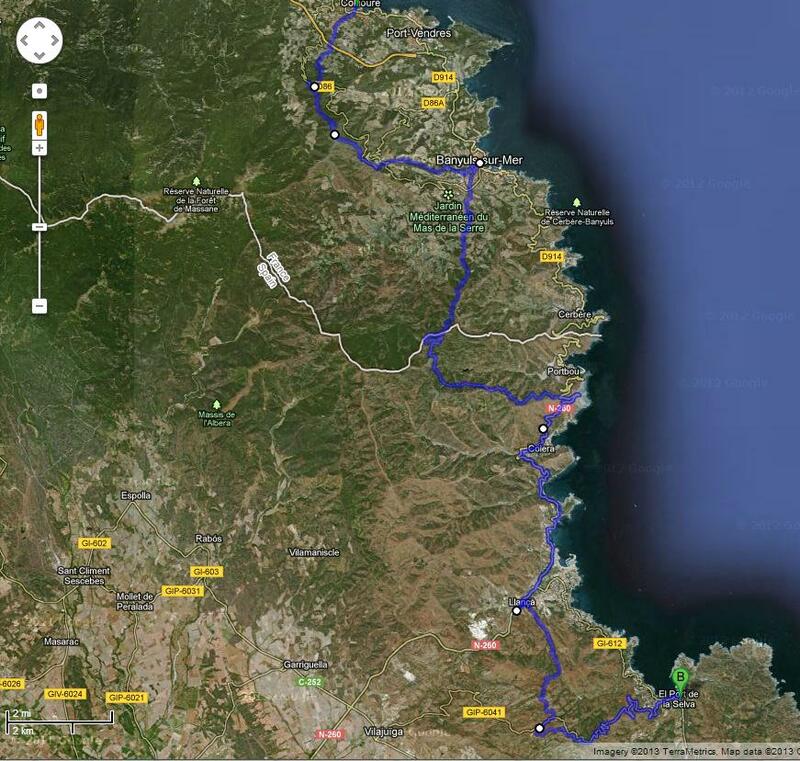 The day’s route, from Collioure to the city of Banyuls-sur-Mer (pop. 5000), would cover 9.3 miles and about 2700’ of elevation gain. 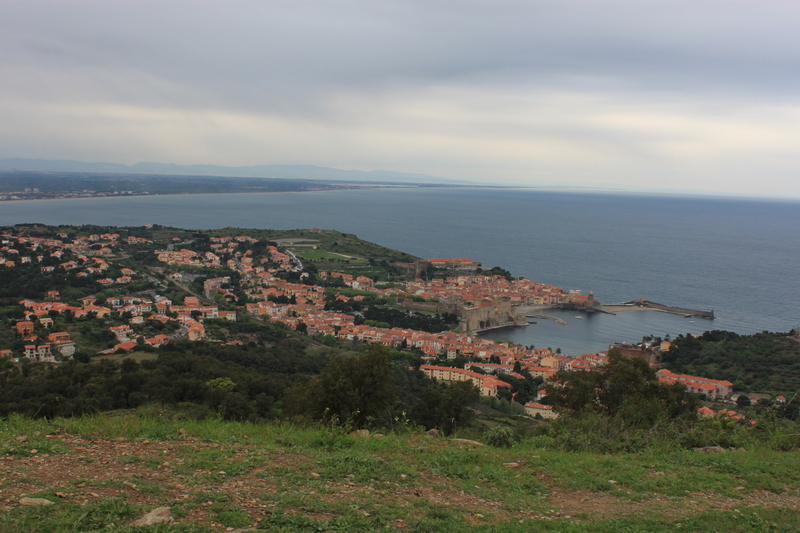 Things started well, as we climbed up away from Collioure, stopping often to look back and admire the views. 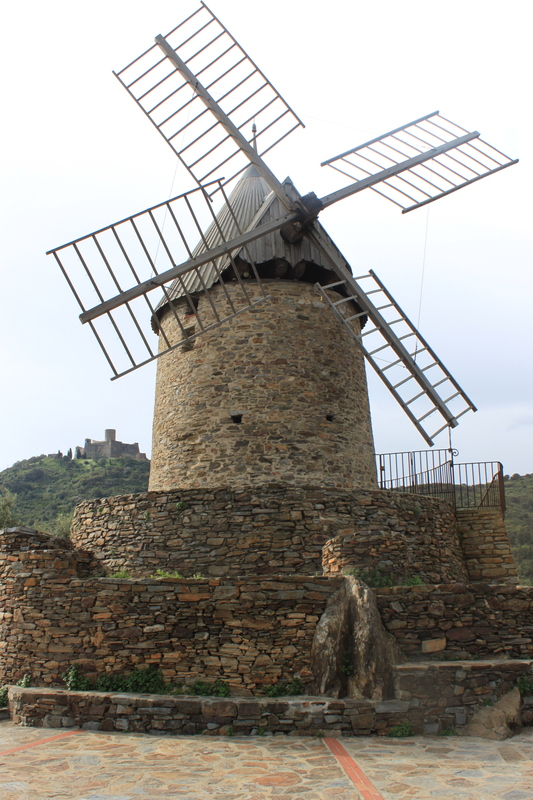 In short order we reached both the windmill and Fort Sant Elme, seen on the hillsides the previous day. Looking up to distant Madeloc Tower. 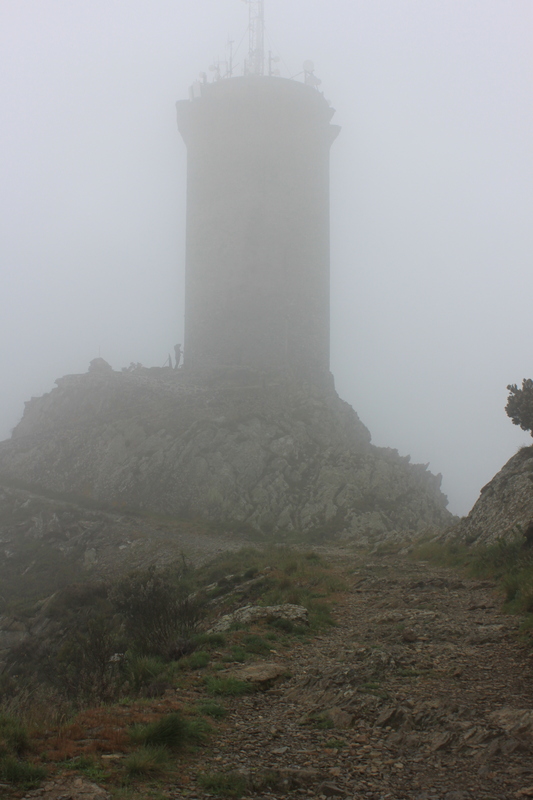 As Madeloc Tower (a 13th century watch tower) grew ever closer, our gain in elevation led to inevitable increased winds and lower temperatures. We stopped for lunch outside the walls of an old fort, then hunkered down for the final ascent. 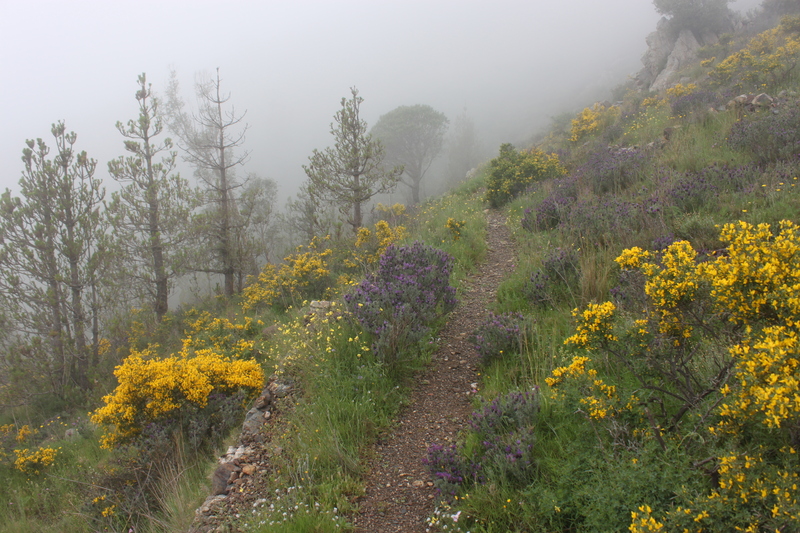 Our path is the one that forks to the right, climbing up toward the peak of the mountain. In that part of the world, they have a name for the high north winds that blow across the mountains: Tramontane. Loosely translated, that means “winds so powerful only Americans are dumb enough to hike up mountains while it’s blowing.” Our directions even included an alternate route if Tramontane was blowing too cold and strong. But though the winds were indeed cold, and gusting upward of 50 mph, we were determined, after our ignominious failure of the previous day, to finish the route as intended. At times this meant leaning into the wind at such a steep pitch that had it abruptly stopped, we would have fallen over. We crouched low and scooted across exposed ridges, occasionally pausing and clinging to rocks when particularly powerful gusts kicked up, but at last we made it to the tower. We arrive at Madeloc Tower. There was one other hiker there, whom you can see standing at the tower’s base, conveniently showing scale. The views were not as stunning as the ones shown on the back of the box, but the feeling of accomplishment was real enough. 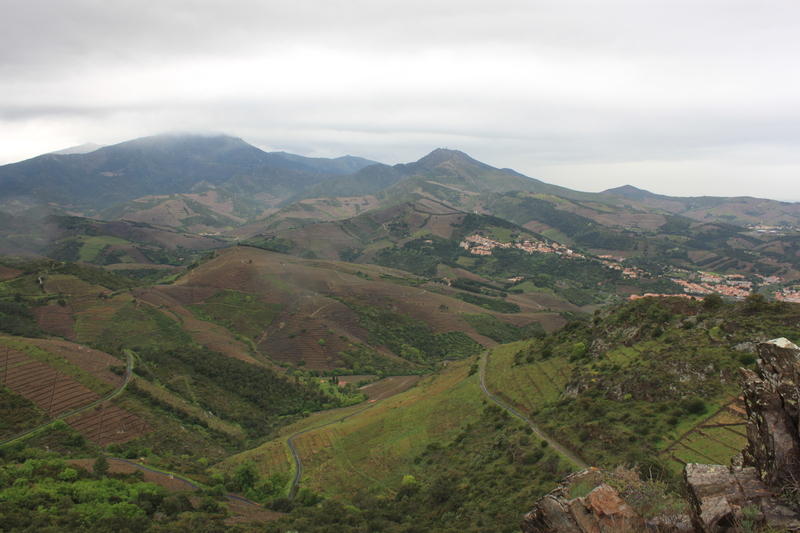 We didn’t stay long at Madeloc, and began our descent toward Banyuls-sur-Mer. As if the cold and the wind weren’t enough, a sideways-driven sleet started up, pelting us with stinging needles of almost-ice. We took shelter for a few minutes in a ruined fort, joining a dozen other walkers who were likewise waiting out the sleet. We gulped some water and ate some Pim’s, but as the sleet showed no sign of abating, we walked back out into it and kept going. 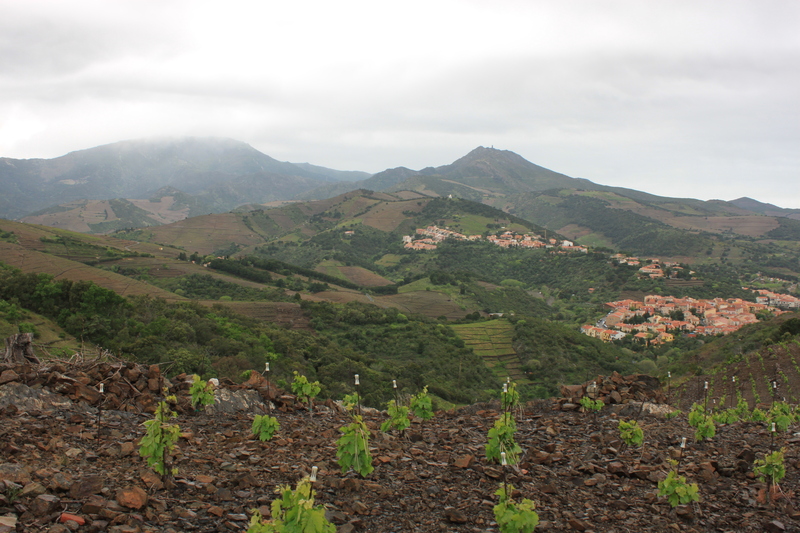 The sleet kept up for about another twenty minutes before deciding to spare us, and I’m happy to say that as we marched down toward Banyuls, the sun even poked its nose through the clouds, making the final couple of hours extremely pleasant. 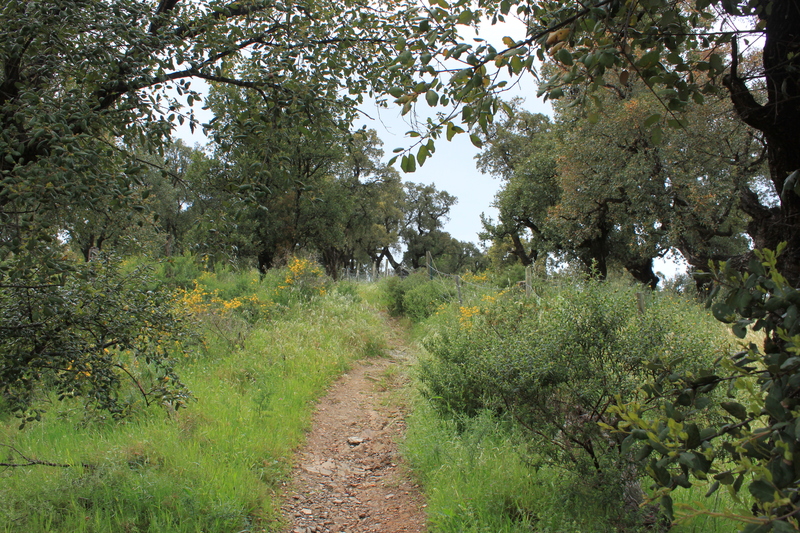 We followed the well-marked GR-10 footpath down into town, where we stopped for crepes in a local restaurant before walking the final 15 minutes to our hotel. Dinner at the hotel restaurant was lovely and featured a variety of local fromages. A postscript: shower stalls in France feature a variety of mysterious extra nozzles and handles not typically found in the States. When I turned on the shower, water sprayed unexpectedly from a secondary shower-head that was angled upward such that in about five seconds, I had hosed down every wall in the bathroom. Silly American! That was Kate’s comment as we walked through town to start another day of hiking. 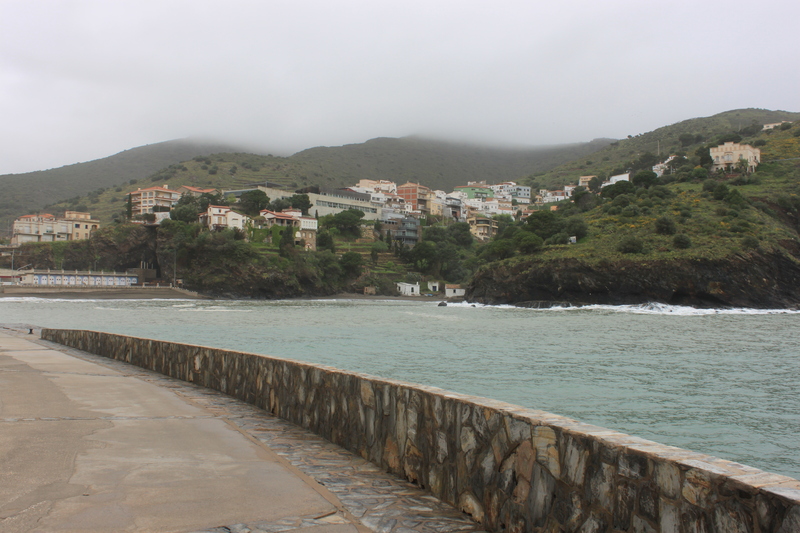 The sky was overcast, and the Mediterranean a steely Atlantic gray. The weather forecast was extremely grim: rain in the morning, rain in the afternoon, more low temperatures, and a strong wind throughout. But for the morning, at least, the rain held off and the air wasn’t too cold. Also this was a shorter and easier day than yesterday – 8 miles of walking, with about 2000’ of elevation gain. As if to drive the point home, our directions indicated that we should “…walk along [the] road, with a dry riverbed on the left…” but the riverbed was anything but dry. Dozens of swallows took advantage of this unusual state of affairs, darting and swooping and collecting the insects the water had brought. 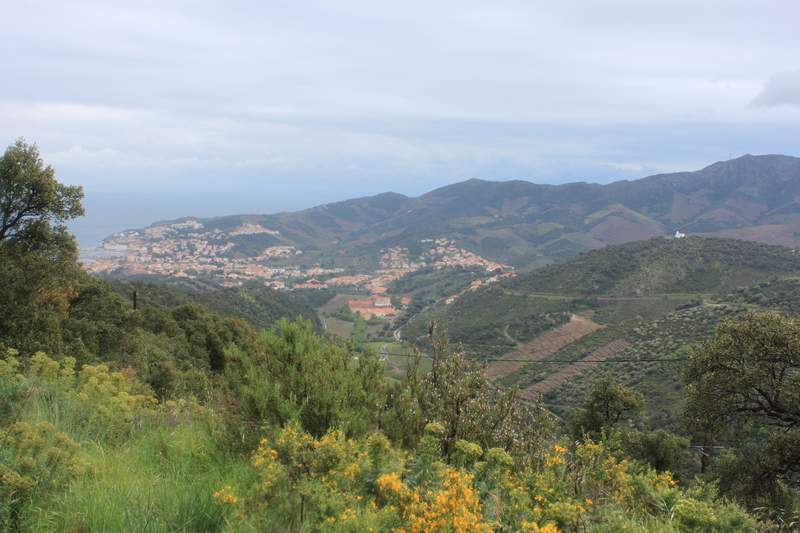 The first part of the walk was a steep, zig-zagging ascent through the outer streets of Banyuls-sur-Mer, before the trail rose up and away from the town. 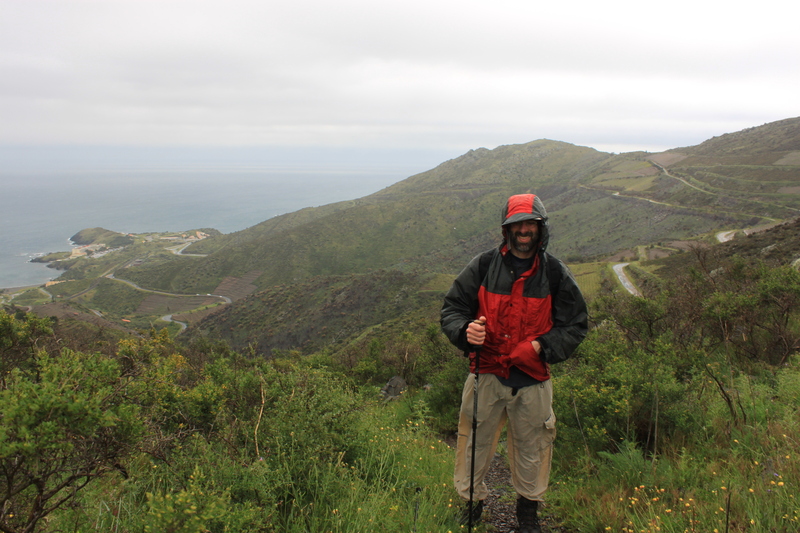 The rain held off until we were up on an ascending ridge, and even when it fell, it wasn’t a torrential downpour. After a slightly-harrowing ridge walk with a cliff on one side, and an upward climb following a dry stone wall, we reached the final scramble to a local maximum. The directions were phrased thusly: “About 6 mins after the wall, you are confronted with a rock band in front of you, a 5 metre strata of schist. Don’t bother looking for a way around it, the yellow waymark on your left means go straight up!” But it wasn’t any more difficult than any number of rocky scrambles we’ve made in New Hampshire, and soon we were having a snack next to a high tension power-cable pylon perched on the hilltop. 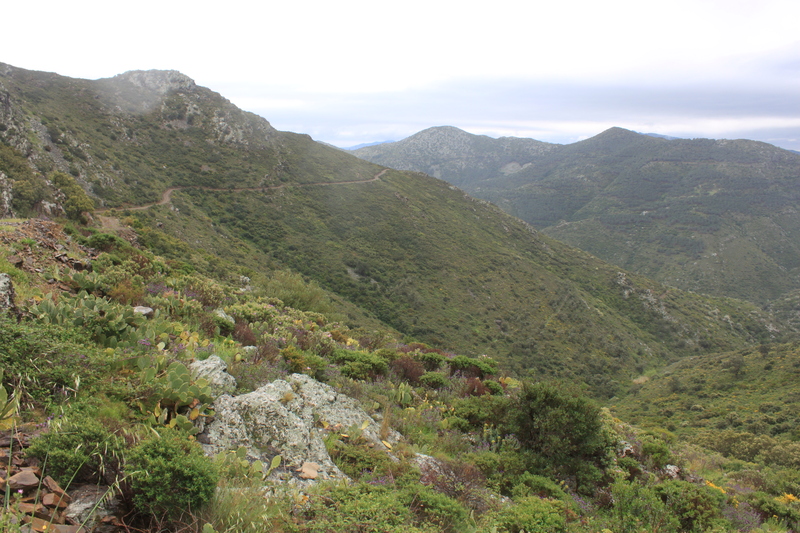 The rain was on-again, off-again (though mostly on-again) as we traversed a long section of high trail cut into the mountains that separate Banyuls-sur-Mer from Cerbere, and Cerbere from Portbou. 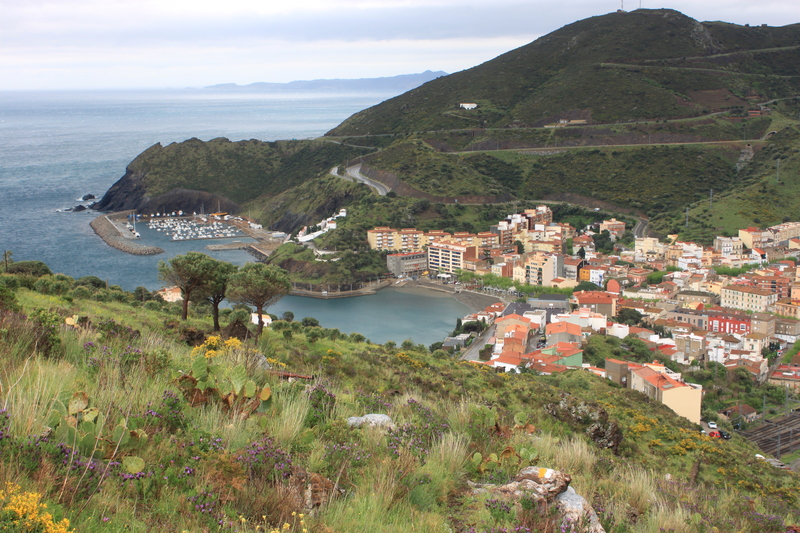 Portbou (pop c. 1300) was the Spanish town where the day’s hike would end. There were lovely views throughout, and while the cold, wind and rain prevented us from appreciating them properly, Kate still stopped to take pictures. Good thing those are quick-drying pants! Looking back on France, which were just leaving about now. The mountain pass to Portbou, Spain. 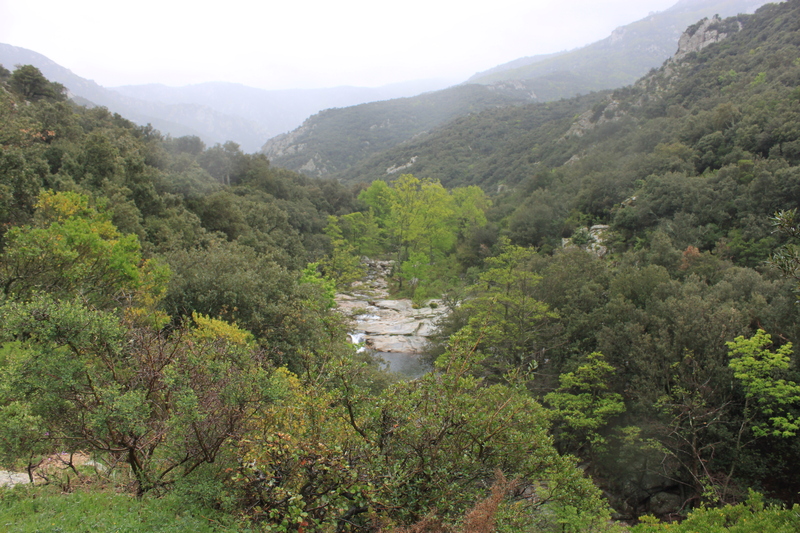 The rain let up slightly as we crested another hill and reached the ridge separating from France from Spain. 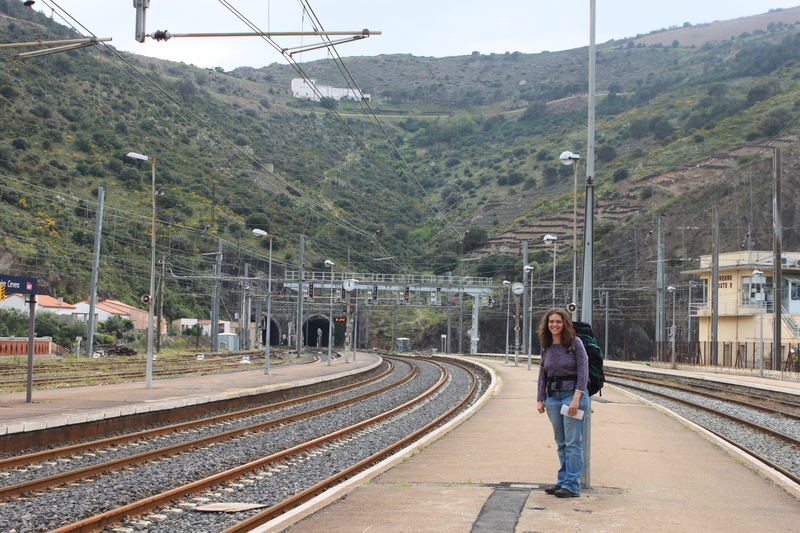 We stopped there for lunch, and to take the inevitable pictures where we’re standing in two countries at the same time, before starting the long descent to Portbou. Given the portentous weather forecast heading into the day’s travel, we were counting ourselves extremely fortunate that for hours now, the rain had been sporadic and mostly light. It turned out the Weather Gods were just toying with us. 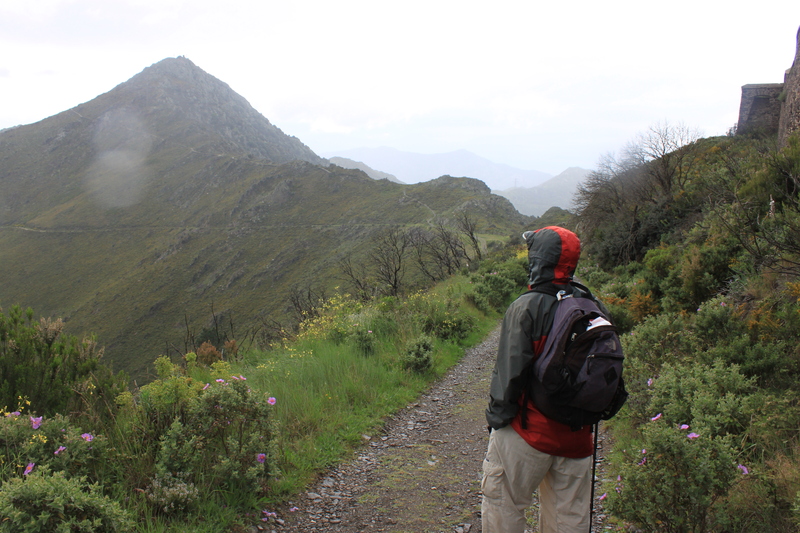 While still on the high and shelterless trail, the heavens opened wide and sheets of rain fell upon us. Or, more accurately, sheets of rain were driven sideways into us by the 30+ mph winds blowing across the ridge. It was like being sprayed by a host of angry firemen just off stage, and in less than a minute we went from tolerably damp to just-climbed-out-of-the-pool drenched. Our boots filled with water in about 20 seconds, so every step thereafter was made as if our feet were simply encased in water balloons. The downpour lasted about 20 minutes, though for the final 19 of those we weren’t really getting much wetter, having so quickly reached maximum saturation. 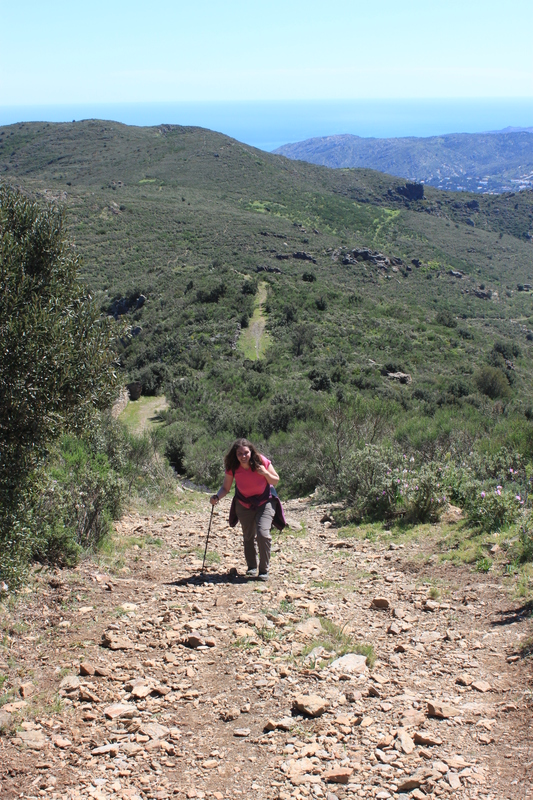 Perhaps realizing their diminishing returns the Weather Gods turned off their hoses, and the final hours of downward trek into Portbou were actually quite pleasant, marred only by the squishing sounds our feet made with every step. 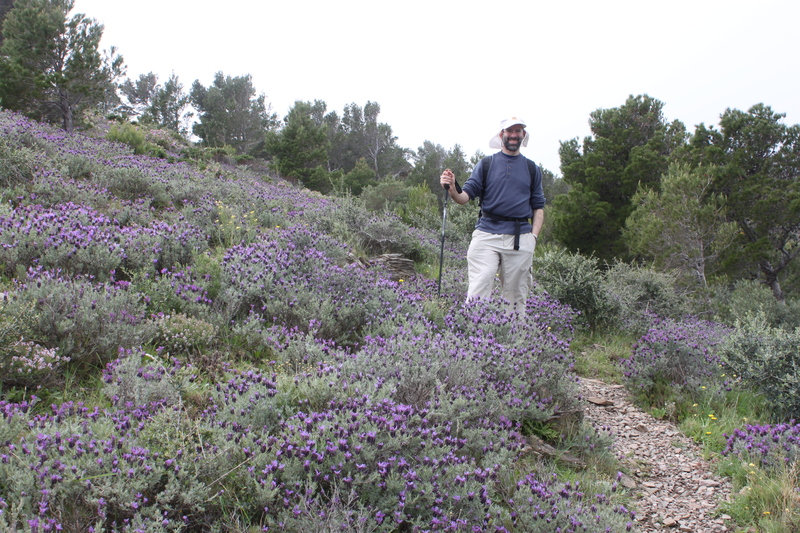 The hillsides above town were covered with cactus and lavender, and we wended our way through on a tiny narrow path, at last reaching town and our hotel. 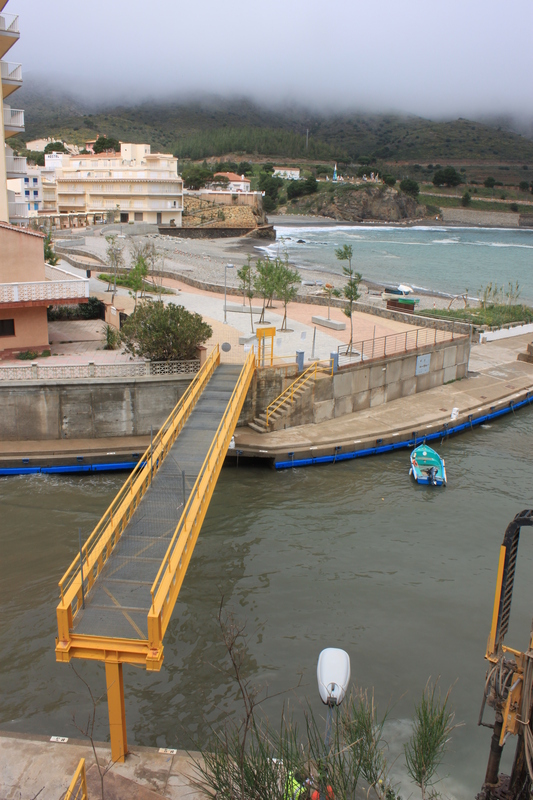 Starting the final descent into Portbou. We managed another FaceTime session with the kids that evening, and they seemed both happy and uninjured. Actually, they seemed like circus clowns, since the moment they realized they could see themselves in the little FaceTime window, they started hamming it up, making one ridiculous face after another, giving each other bunny ears, and constantly shoving one another out of the frame. Good luck, Grands! 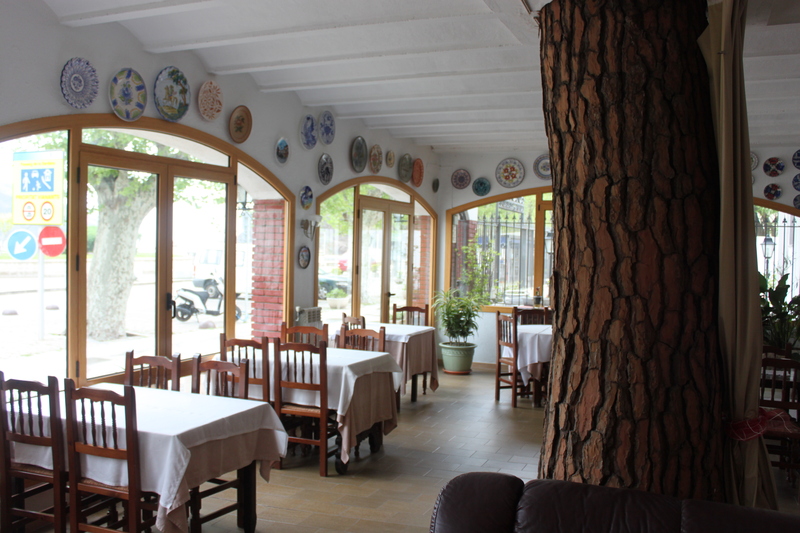 Portbou was a sleepy little town, and there wasn’t much of interest save the tree that was growing inside our hotel. 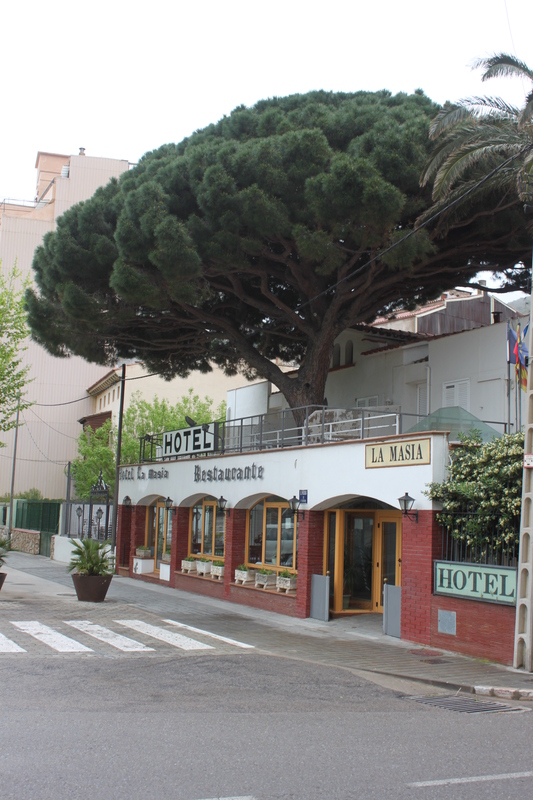 Is that a tree growing out of our hotel? We walked around a bit before setting out for the day’s hike, mostly in the vain hope that the bakery down the street would open up. It didn’t but we weren’t too worried about provisions, since we’d be passing through an intermediate town half-way through the day, and there was purported to be an excellent restaurant on a beach we’d be reaching around lunchtime. 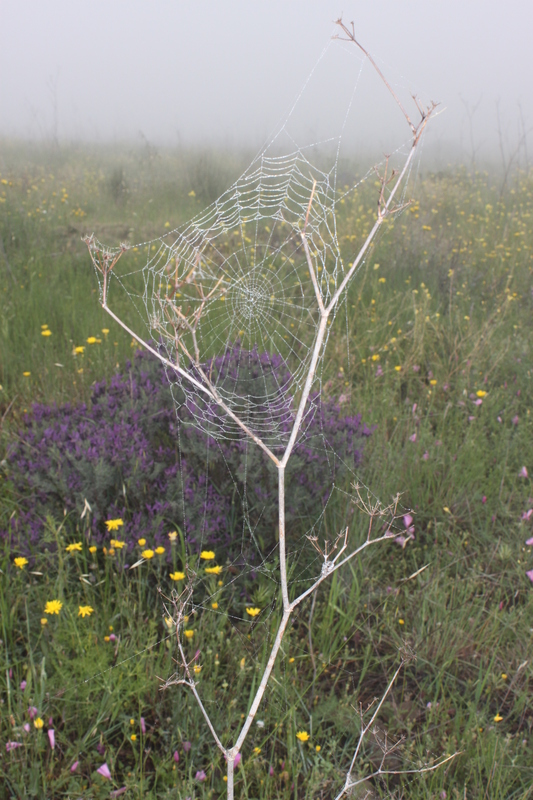 The weather was still Scottish; a bit warmer, perhaps, than the previous days, but the clouds were draped low over the hills, and a damp mist filled the air. 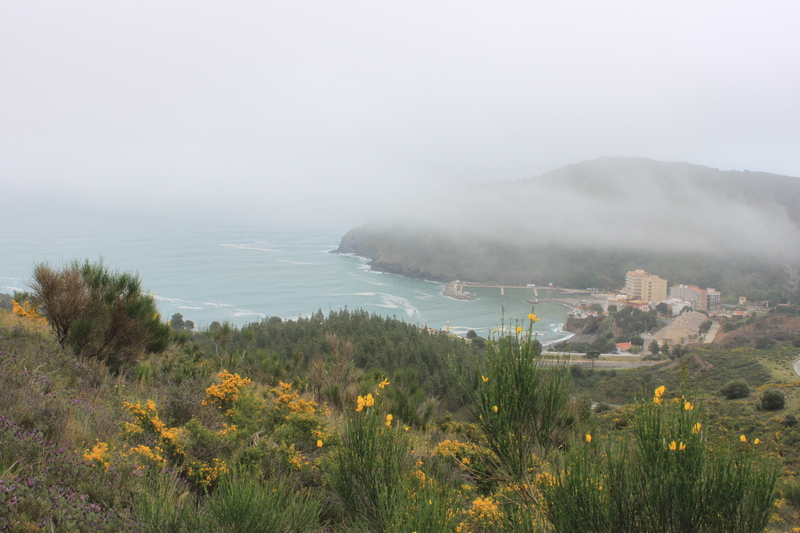 We climbed up a steep hill out of the town, rising into the clouds, and soon Portbou had vanished into the fog. Today’s leg was 8 miles, with 1650’ of elevation gain. 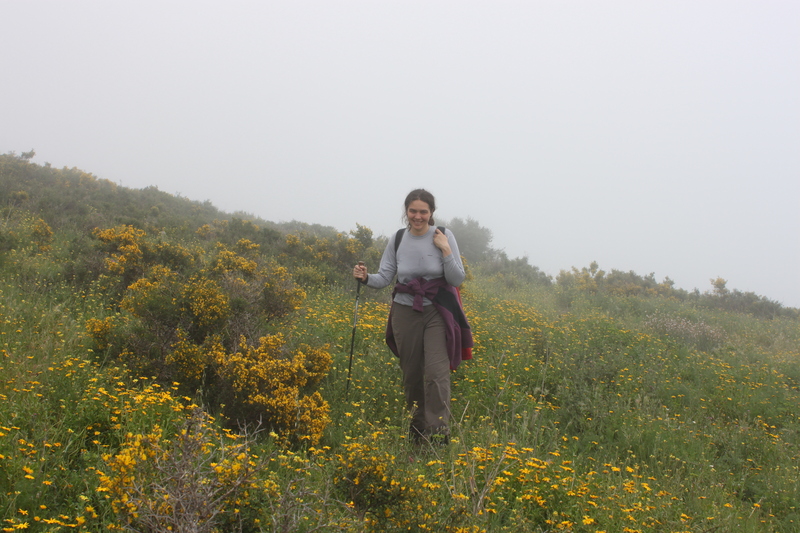 The trail was beautiful as advertised, and the Mediterranean below us certainly sounded lovely, but we couldn’t see anything more than a hundred feet away seeing as we were walking inside a cloud bank. Since we couldn’t see anything distant, we focused on close-up things. 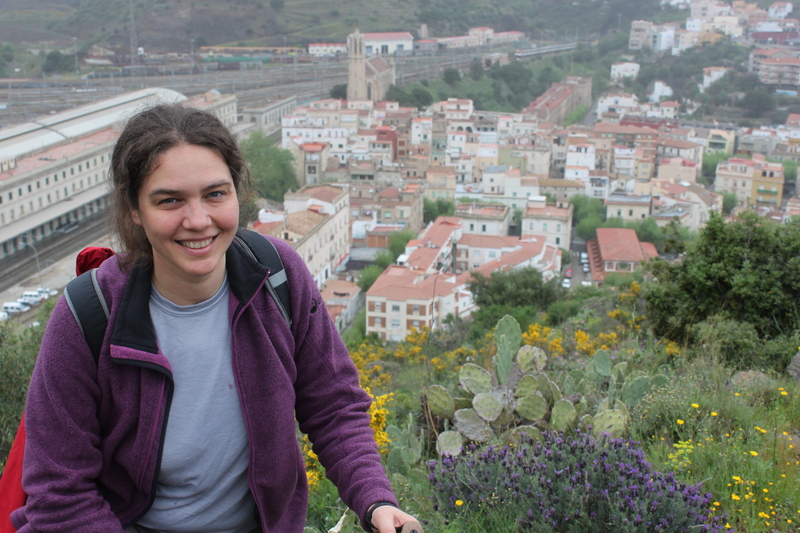 After a time the trail veered downward and below the cloud layer, and we descended into the small town of Colera (pop. 600). We stopped for some ice cream, but Kate convinced me that we didn’t need to eat anything more, since we weren’t far from Garbet Beach where the restaurant awaited. The directions indicated that we should cross a bridge over the bay – the only bridge, apparently – but it was closed for construction. Hm. We sat and consulted the topo map on our iPad, and found an alternate route that followed a trench-road with a steep rough-cut stone stairway rising up where the bridge would have ended. Let’s not go that way. Dorian amidst yet more flora. The original pathway cut over to a mainland track that brought hikers down to Garbet Beach, but a rich landowner had built a house across it and prohibited hikers from trespassing. 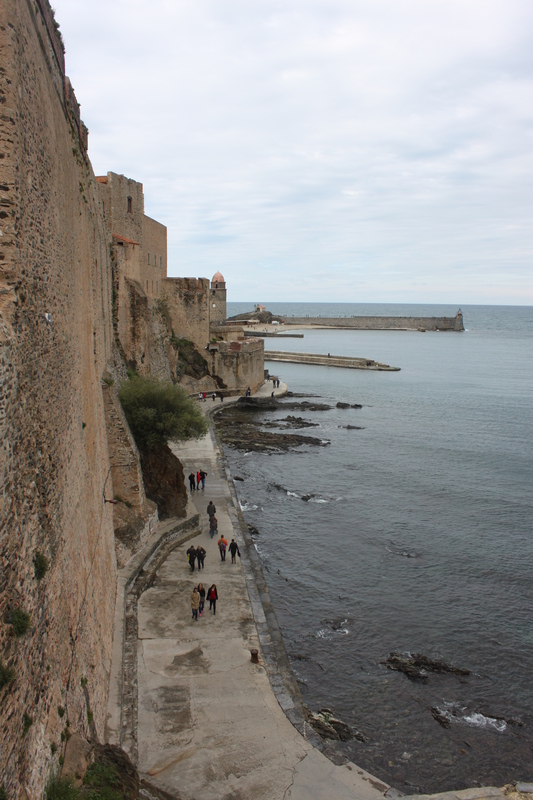 Instead, we had to skirt around the cliff face, as the new path involved wading through the Mediterranean. Had we arrived at low tide we wouldn’t have gotten our toes wet, but we didn’t, and there was probably some extra surge from all the recent wind and rain, so in places we were up to our knees as the waves came crashing to the cliff wall. The trail goes down to the left, around that short cliff. 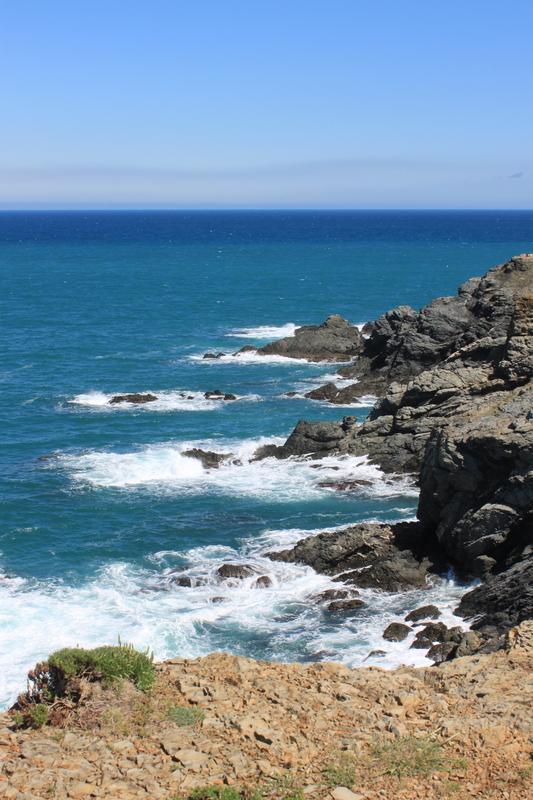 It took us only about 15 minutes to wade and rock-hop around the cliffs, after which it was only a short walk across the beach to the restaurant. Reports that I gave Kate a hard time about this are not exaggerated in the slightest. 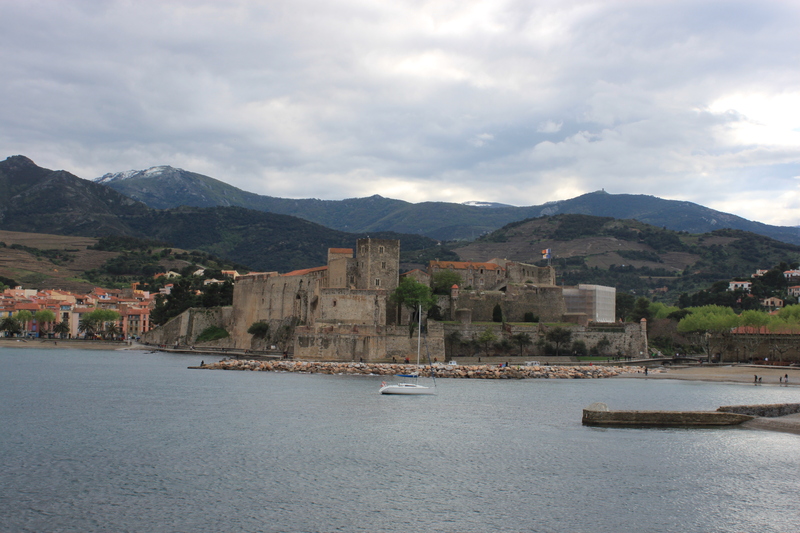 Lunch consisted of two apples we had been lugging around since Collioure, and a half-empty container of Pim’s. As we prepared for the final leg of the day’s walk, a very strange thing happened. A weird and frightening yellow orb appeared overhead, and both sea and sky turned a very strange blue-ish color. It was very confusing at first, but after some discussion we figured out what was going on. The sun was shining! We took many pictures of this odd new phenomenon. The sea… the sky… what color *is* that, exactly? Despite our hunger, our spirits stayed high as the day grew brighter and bluer, affording us (finally) the views we had been hoping to see since the start of the walk. 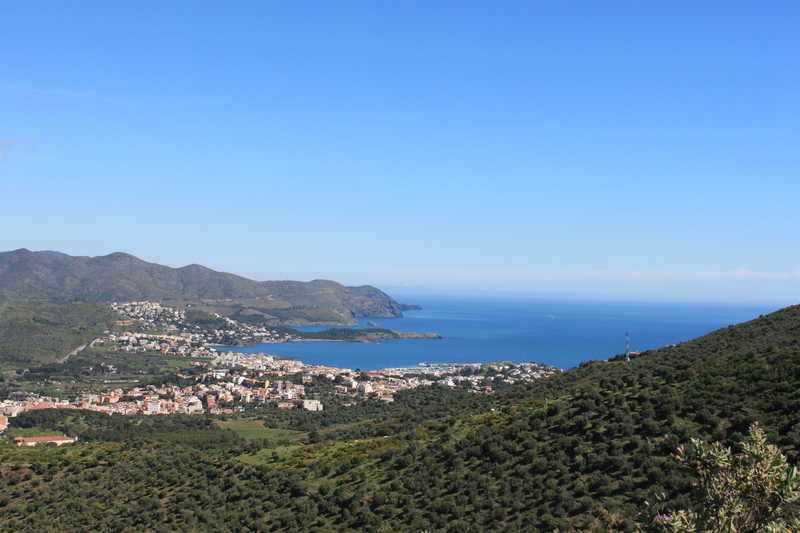 The city of Llanca sprawls against the opposite side of the bay. Finally we strolled into the large town of Llanca (pop. 5000), where we stopped at a beach-side tapas restaurant that had the decency to be open. We sat, delighted, watching kids frolic on the beach while we ate anchovies and calamari and Kate consumed a large glass of sangria. 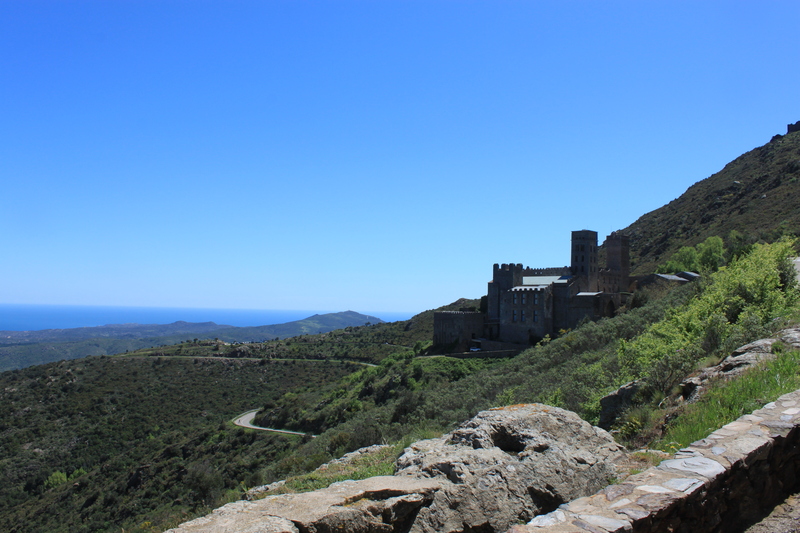 This was the final day of our walk – an expected 7.4 miles, with 2750’ of elevation gain, between Llanca and Port de la Selva, with a midway stop at the monastery of Sant Pere de Rodes. 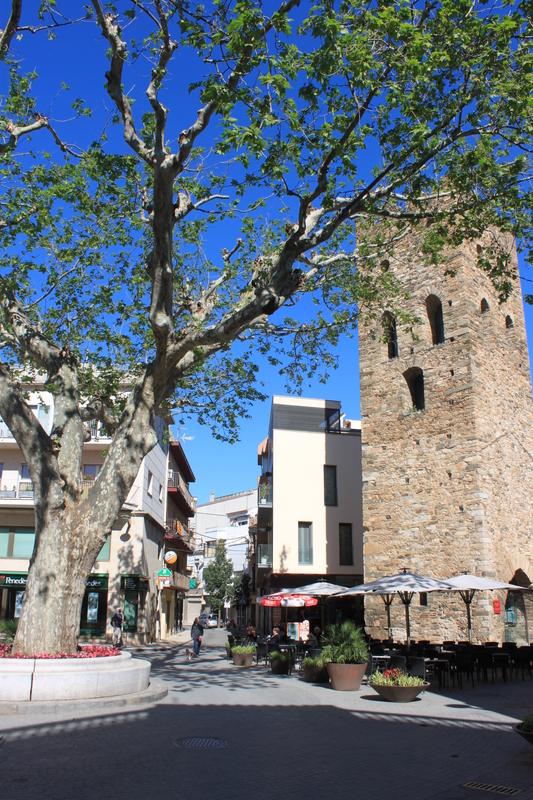 A small plaza in Llanca, with its prerequisite tree and tower. 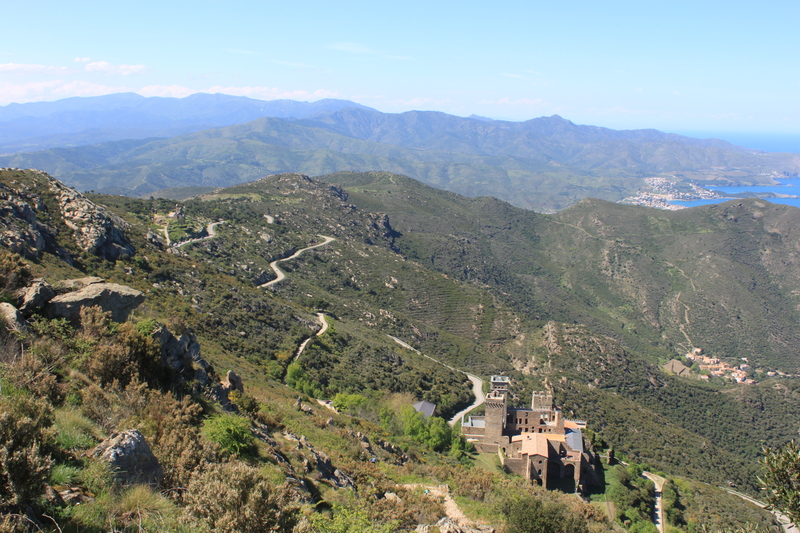 For the fourth straight day we climbed steeply up from our starting town into the low Pyrenees. To our confusion and delight, the sun shone from a warm blue sky for the entire day, and so we were able to soak in the experience in a purely metaphorical manner. 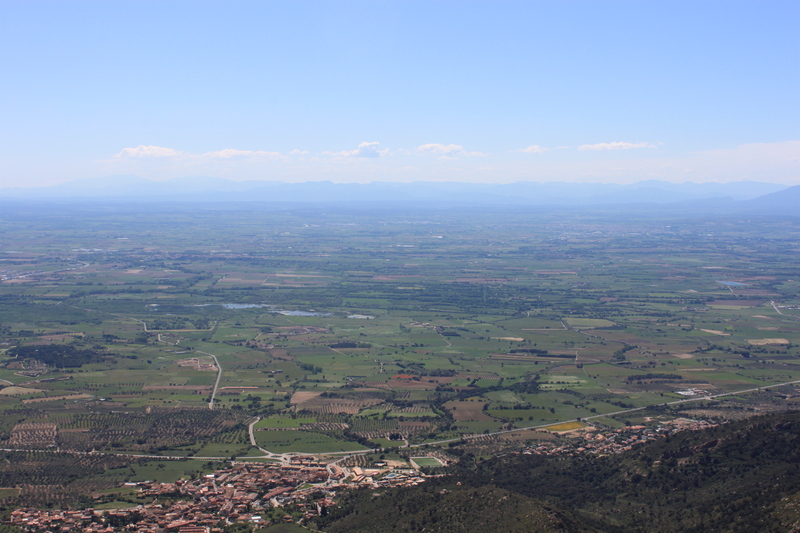 Looking down on Llanca. 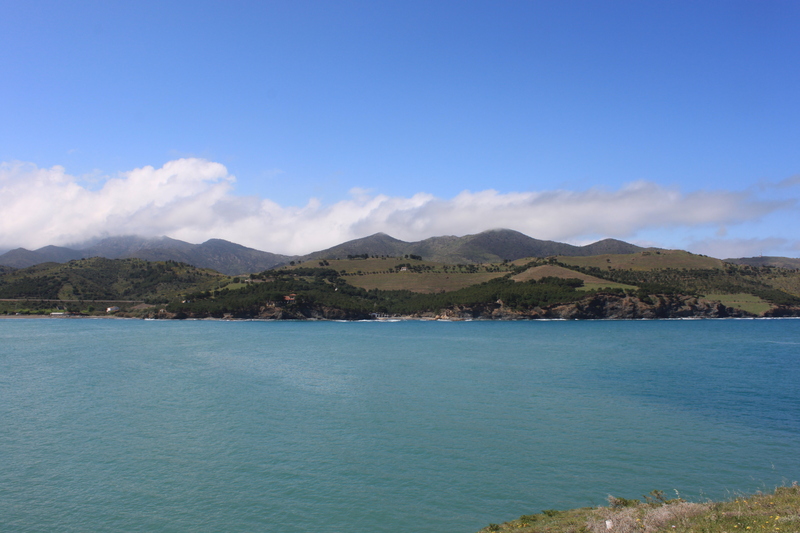 What’s nice about this photo is that the most distant headland is the one we skirted around on the previous day’s walk. 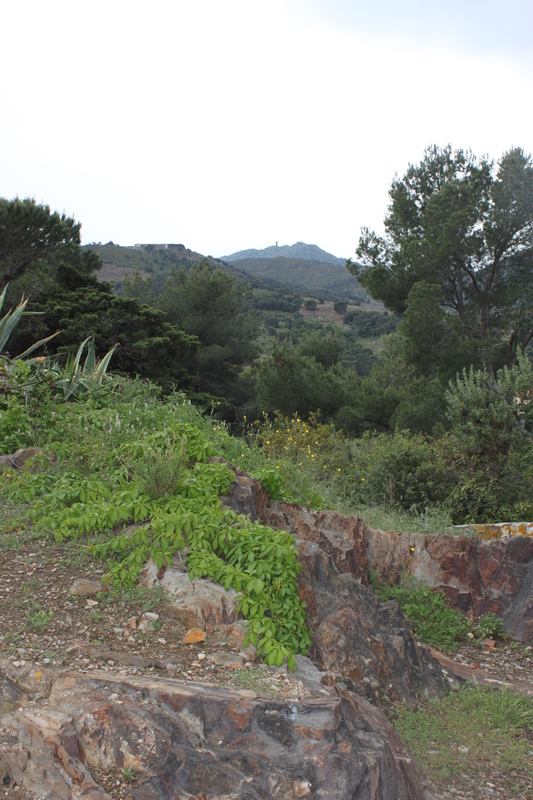 The trail wound up and over the hills, through ancient stone walls, until we started getting peeks at Sant Pere de Rodes. Finally we reached a gap between peaks call the Col de Perer, from which the expansive views over endless miles of Spanish farmland were utterly breathtaking. 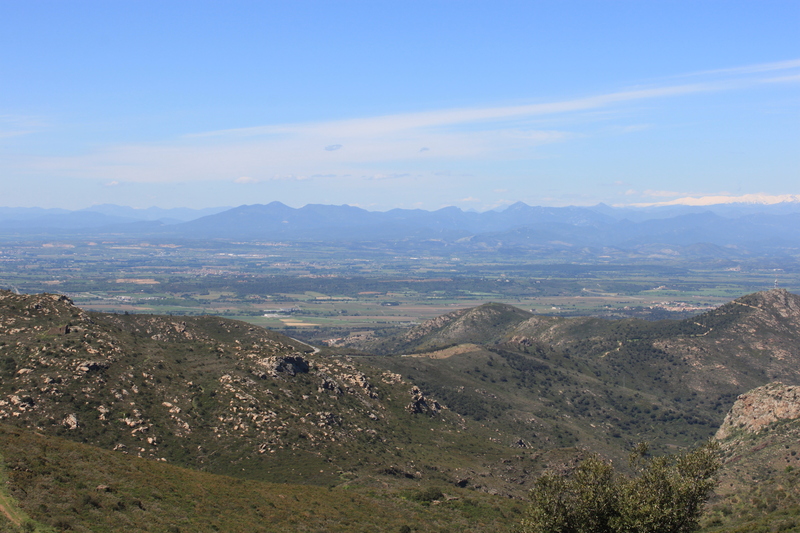 View westward over Spanish countryside, as seen from the Col de Perer. From there, a wide dirt track led slowly upward to the monastery, a Benedictine abbey constructed mostly in the 10th through 12th centuries. 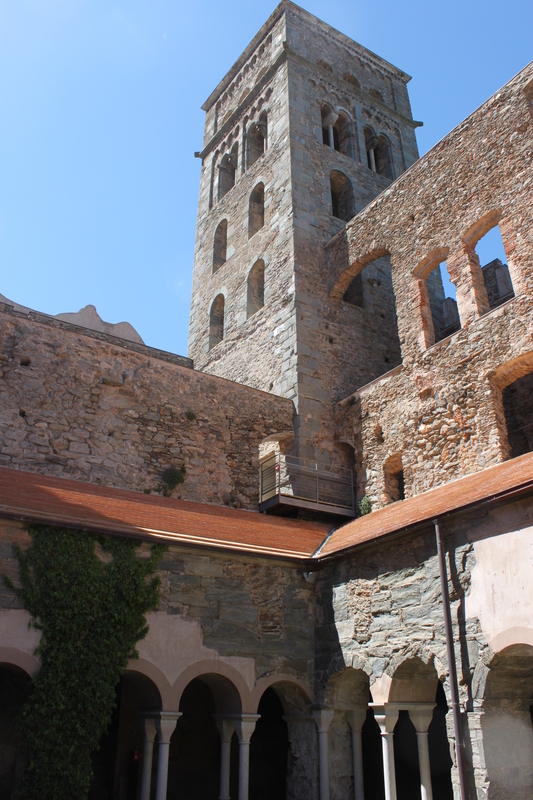 There we had lunch and spent an hour exploring the monastery’s interior, before hiking the 500’ up to the ruins of a small castle perched on the mountain peak above. Inside Sant Pere de Rodes Looking back upon Llanca from the monastery. 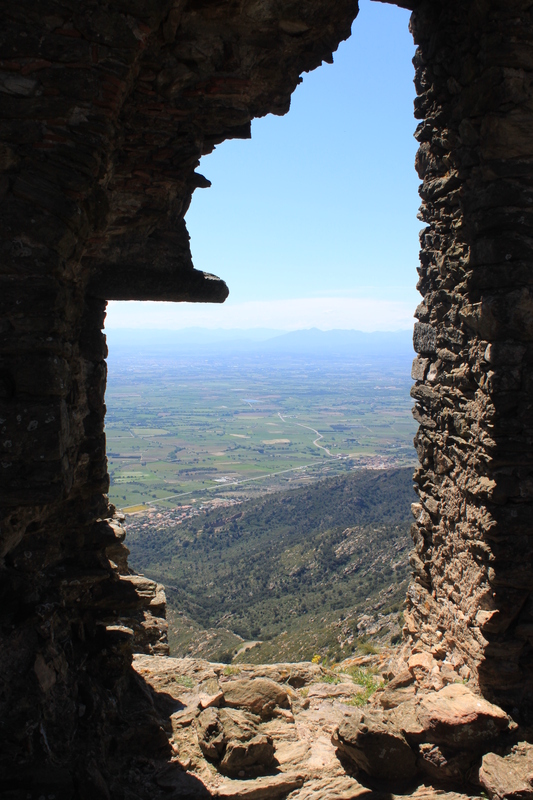 Spain, as seen through a window of Castell de Sant Salvador, above Sant Pere de Rodes. 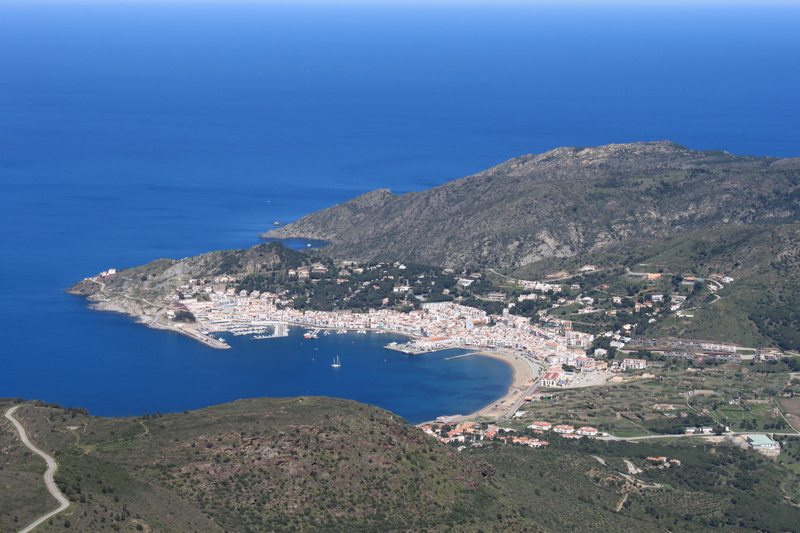 After reveling in more fantastic views, we started the parachute-drop descent to Port de la Selva (pop. 1000), losing over 2000’ of altitude in less than two miles. 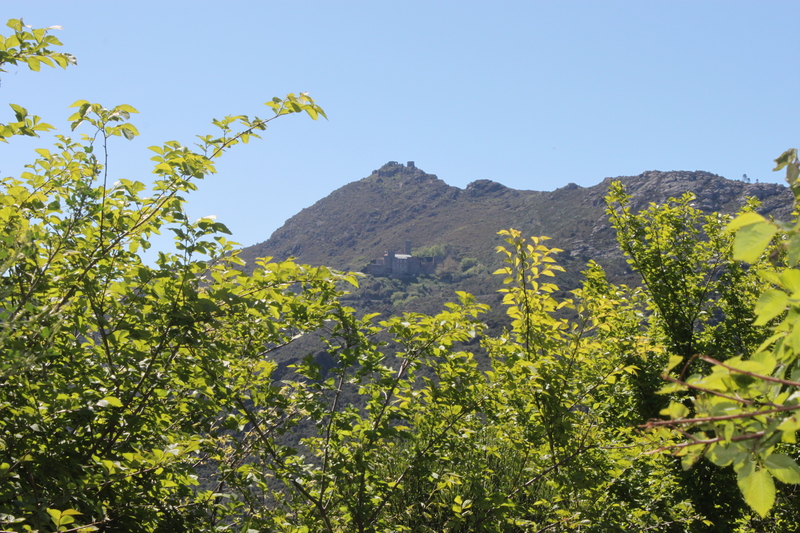 Sant Pere de Rodes, seen from above. 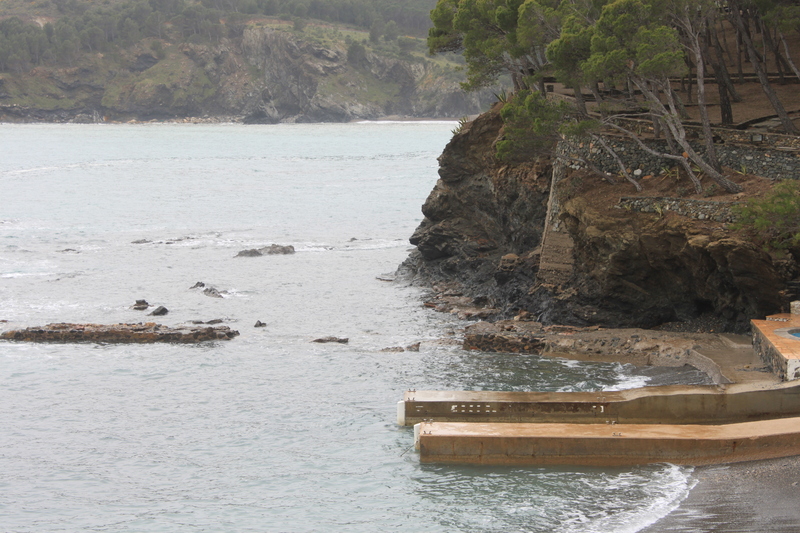 Port de la Selva, at the end of our multi-day hike. 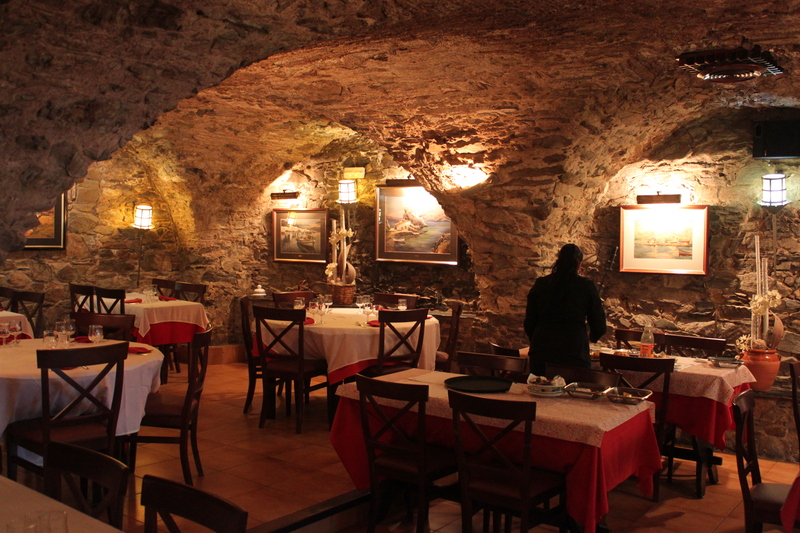 The funky vaulted restaurant at the Hostal La Tina, Port de la Selva. 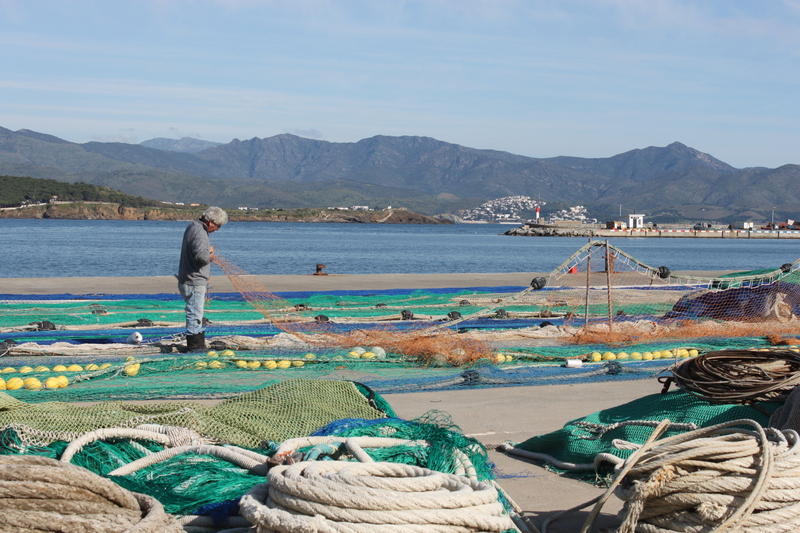 A fisherman plies in trade in Port de la Selva.